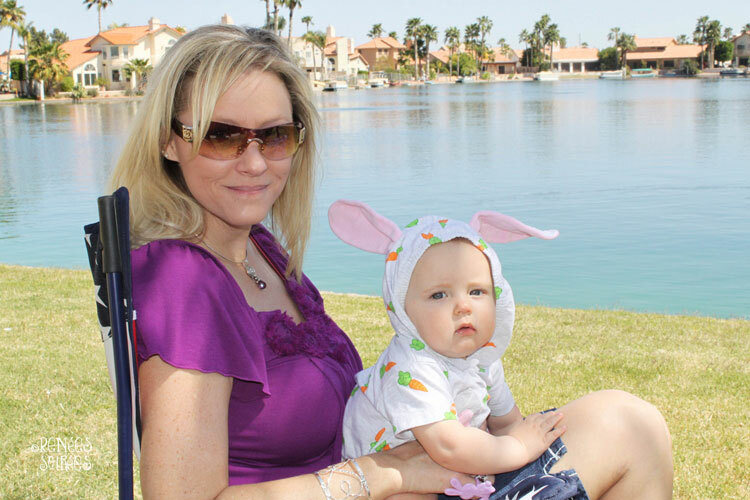 Easter is my MOST favorite holiday. 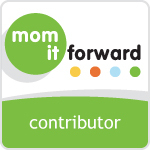 How could you not love the pastel colors, the spring blossoms, the fun activities for kids, and the message of hope? 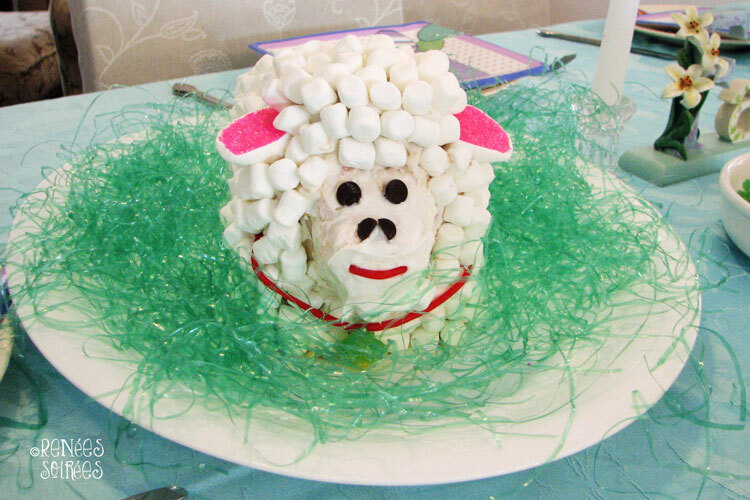 We made this adorable Lamb Cake with the kids, who were able to do much of the decorating, because it was fairly easy. 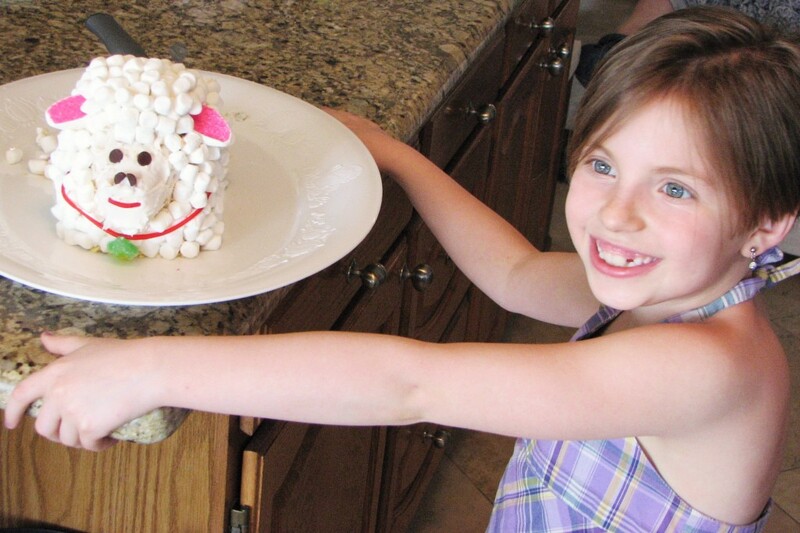 Plus they really wanted to sneak a bunch of mini marshmallows into their mouths in the name of ‘helping’. The original diagram on how to cut the cake is missing from the recipe link, so this next photo will give you an idea of how it’s done. You start with 2 Sara Lee frozen butter pound cakes. 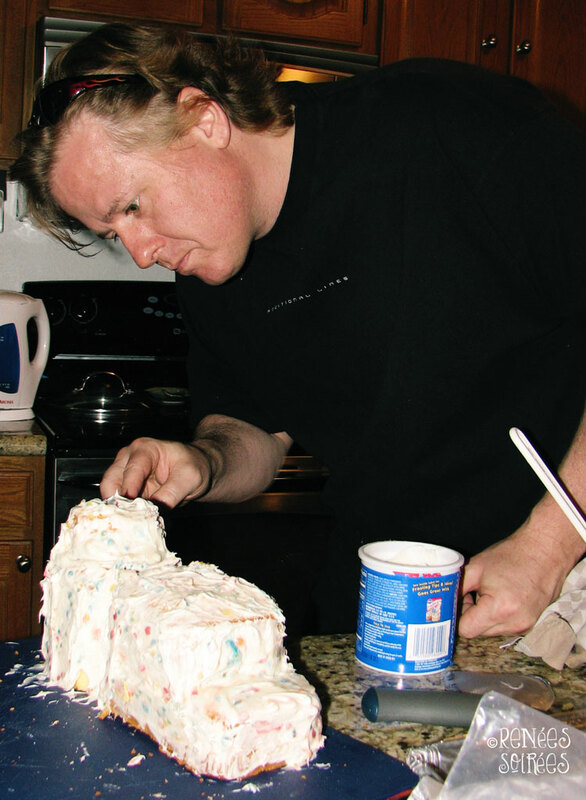 Cut a few inches of one of the cake ends off, and place it on the top of itself, on the opposite side. That becomes the head. Cut another few inches off the backside again, and cut it again into a shape that would fit into a Dixie cup (approximately), to form the muzzle or face of the lamb. In hindsight, I would probably skip the collar. 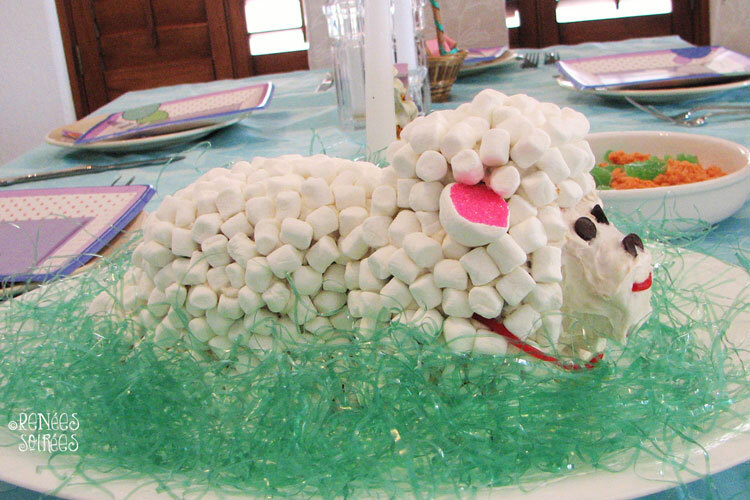 It was a sweet lamb without having to be domesticated. 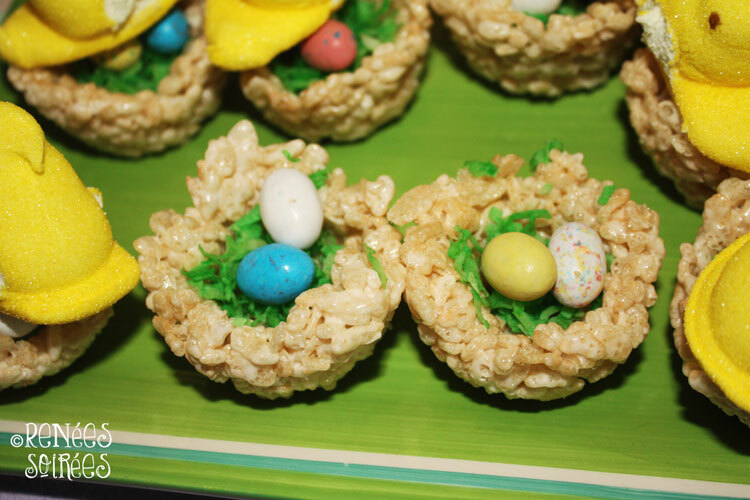 And here are some more Easter treats… RICE KRISPIE PEEP NESTS! 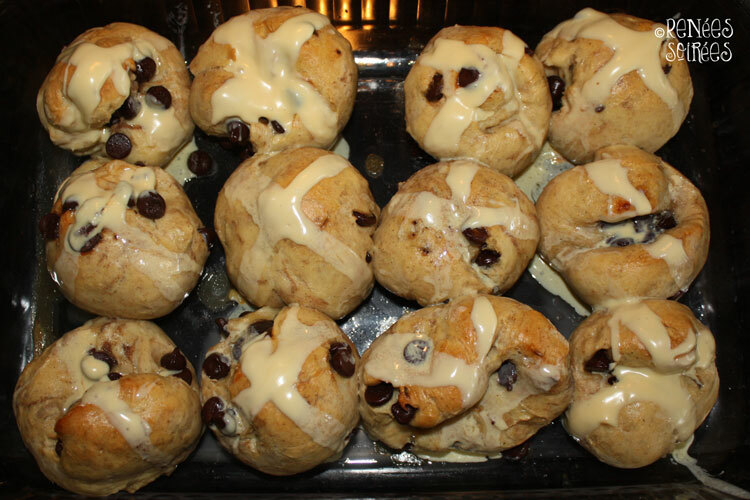 I made these in muffin tins… here is my previous post about how I did them. I brought my recipe back from Australia, so the measurements are not easily ‘translated’, but here is a similar recipe that I have also tried. That one calls for cinnamon chips, which can be difficult to find, so you may have to substitute chocolate chips anyway (oh the horror). Hopefully he will forgive his mother’s CHEESEBALL side someday! I already know he will probably get married on a remote beach somewhere, so there can be NO slideshow. Haha!